X-Factor is one of my new TV addictions and I loved Demi Lovato's inverted french braid. So I thought I'd give it a try. It was super simple and chic that I had to share it with you! 1. First, make sure hair is clean, wash, and dry. Flip hair and brush it using a wooden brush. Begin be grabbing three strands from the left, right, and middle. 2. French braid the hair by putting one stand over the other all the while bring new hair from the middle and sides into the strands. 3. Once you have braided the braid half way to the beginning of the crown of the hair, secure the braid with a elastic band that matches your hair color. 4.Grab the reminding of the hair along with the braid and put it in a high ponytail. 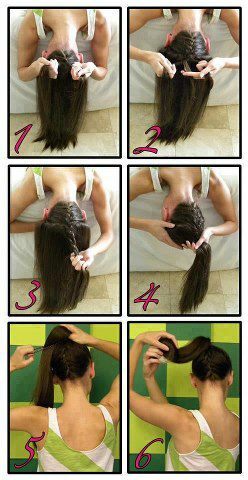 Secure the hair with a elastic band. Use a comb if necessary to get it straight. 5. Once the hair is secure and in a high ponytail, put a chignon threw the ponytal. 6. Spread the hair like a fountain around the chignon and pin the hair strand by strand under the chignon, making it into a circular bun. It takes a little work but it is so worth it. Have fun!